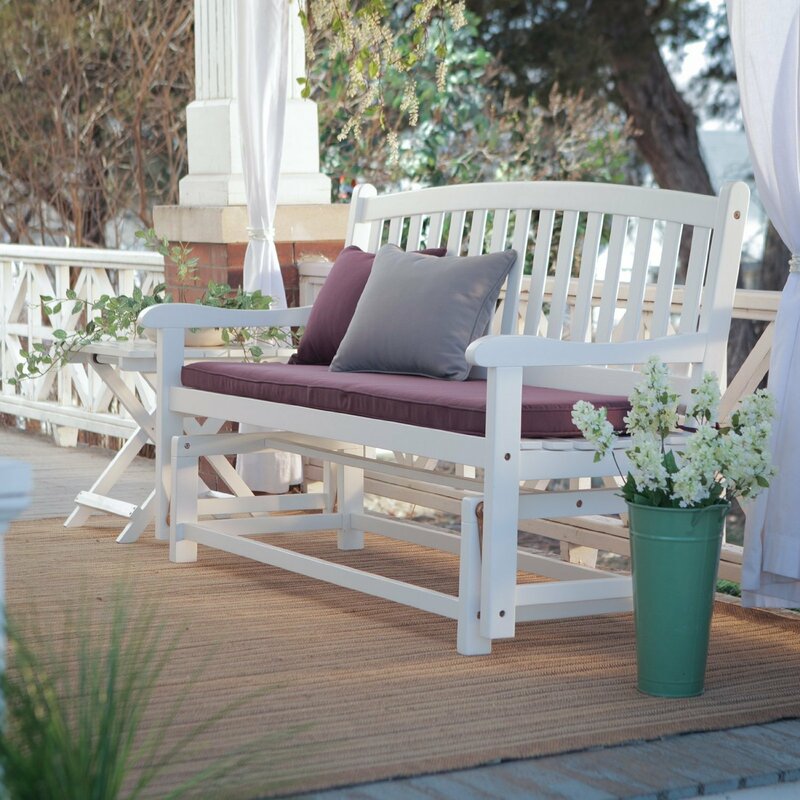 Vintage porch furniture evokes fond memories and feelings. 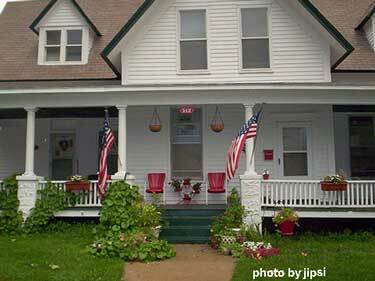 Remember the days of metal chairs and chats on the porch? So, we are naturally delighted to have come across Amy, who is the owner of Mulberry Street, a company that restores vintage metal furniture. It's hard to fathom the condition that some of the pieces of furniture are in before they are restored. Take a look at the amazing work that Amy and her staff of experts accomplish. Watch our fun vintage furniture video! 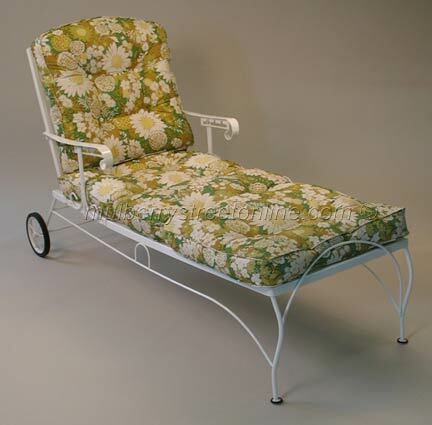 Amy began searching for vintage metal furniture and second-hand treasures with her mom at a young age. Amy says there is a story behind each piece of furniture that her company lovingly restores. With a background as a graphic designer, she loves restoring old things. 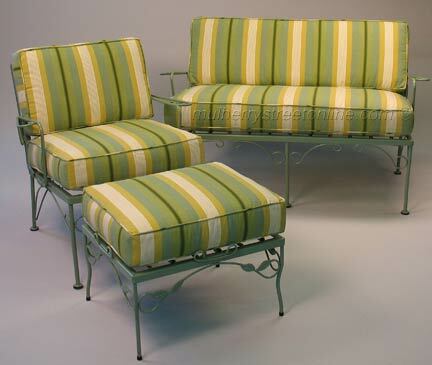 So with the love and help of her husband and her son, Amy established Mulberry Street, her own company that lovingly restores these long-lost old pieces of vintage lawn furniture. 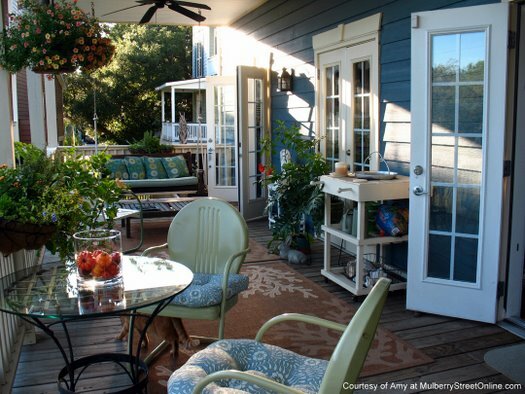 Amy has a great team of dedicated professionals, from sand blasters, welders and repair experts to coaters and upholsterers working on their porch furniture. In some cases, she says, they "perform near miracles to restore it". They carefully inspect the furniture to determine what needs to be done - structurally and cosmetically. Arm rests are removed and the whole piece of furniture is primed and coated. They strip the furniture down to bare metal. Then it is dipped in primer and coated with a high performing weather-resistant finish. They update the colors but try to "keep a kinship with the original look". Amy says that each piece of furniture has seen life and upon being restored, is ready for new life. Her goal is to preserve the character of the furniture. The restored furniture might have some dents and imperfections, but it is sturdy, structurally sound and beautiful! 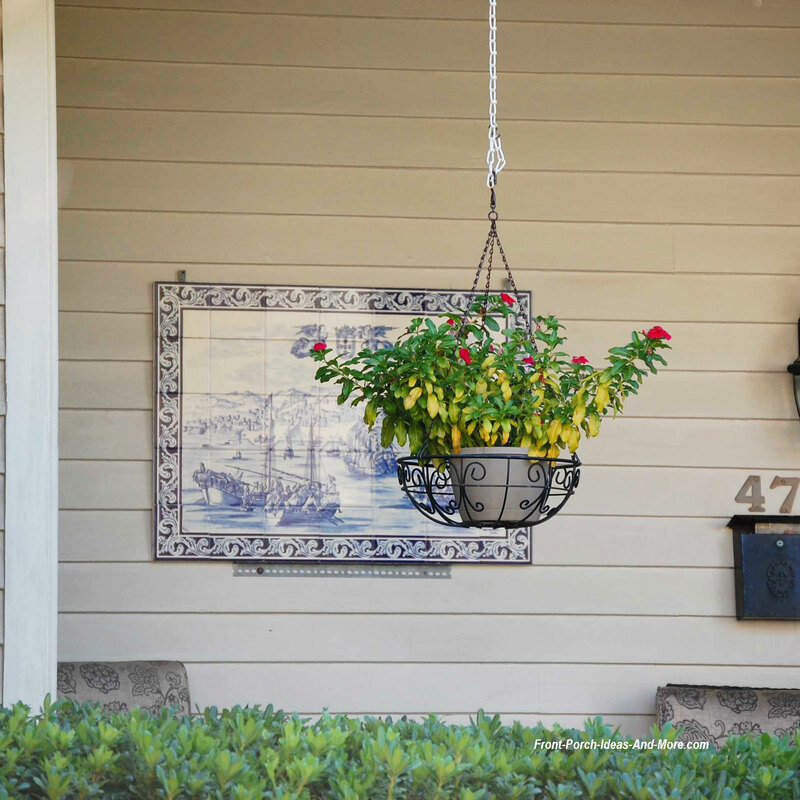 A story of families spending time on their front porches, grandparents and children engaging in meaningful conversations on the porch glider, and sweet simple times just sharing a glass of iced tea in the backyard. 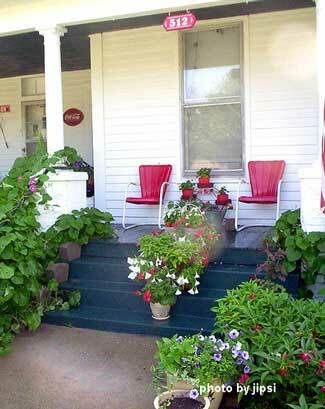 We hope you enjoyed these fantastic pictures of vintage porch furniture that Amy's company has restored. Some of these pieces have already been sold but her inventory is always changing. 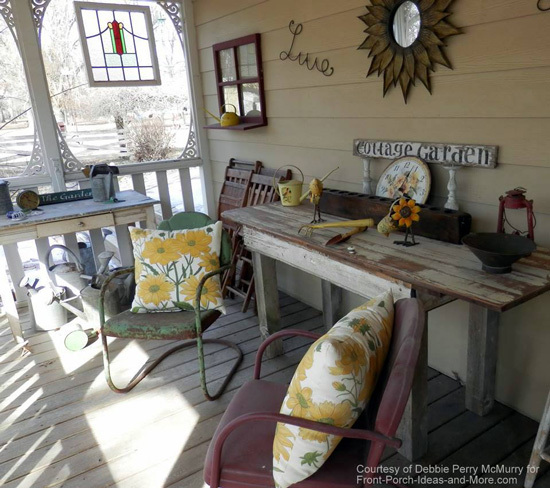 Amy gave us a glimpse of her spacious back porch where some of her vintage metal restorations happily reside. If you ever want a piece of vintage metal furniture like the ones shown here, see what Amy is offering on Mulberry Street. Her vintage furniture pieces are restored with love. We wanted to share this wonderful story about these vintage metal furniture from one of our contributors, Shea. 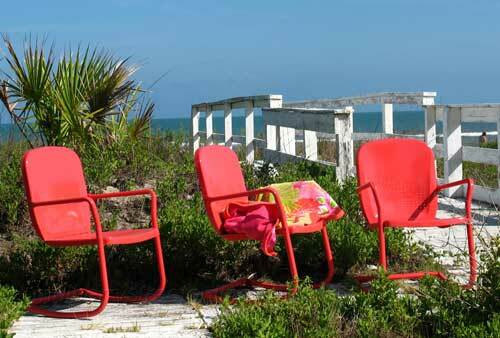 Just like us, Shea is very fond of metal chairs that were prevalent many years ago. 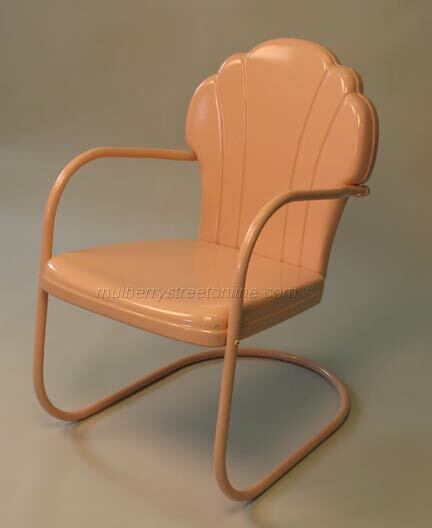 They are still popular today as "retro chairs". 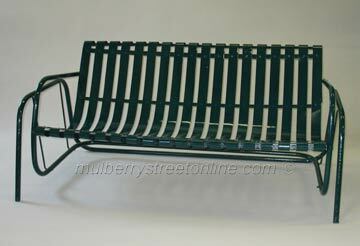 I've always had a fond spot in my memory for these "old time metal lawn chairs". They remind me of getting together with assorted aunts, uncles, grandparents, and cousins on an Alabama or Arkansas lawn on a summer afternoon, tangy smells of pulled pork and BBQ, Kool-Aid (for us kids), barefoot in the grass and chasing fireflies down the slope of the yard as it got dark. There would be slabs of watermelon waiting for us inside the slam of the kitchen's old wooden screen door, maybe a Cola (a whole bottle! ), if we were 'good'. I also remember them as icons of our travels on Route 66: every other motel we stayed at, these brightly-painted metal lawn chairs sat right outside our 'cabin' door. 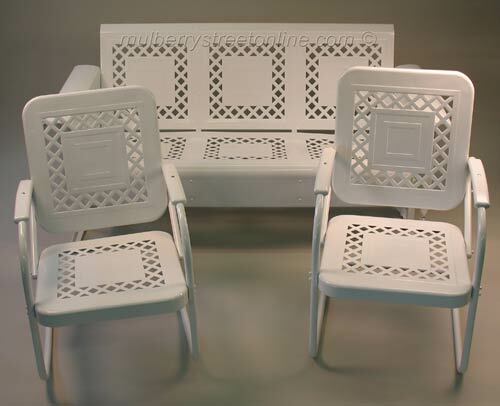 I remember it raining for days, and when the sun finally came out, we kids would race outdoors to play in the glistening wet yard, not minding that the chairs had 'puddles' in them when we sat down (well, we may have minded THEN, but not now, when I look back...). In the fall, my Dad would take all of our chairs (about five or six) and put them in a row against the garage,upside down to keep snow and rain from 'ruining the seat'. 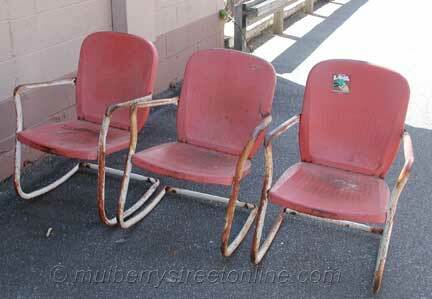 No one wanted to sit in a chair with a 'rusty' seat, I recall. So I put them on my porch because I LOVE being reminded, daily, of what summers used to be, when I was a child, and what summers ARE to me, now, as I get older. They're a sweet kiss from my childhood. I saw an ad in our local Community News where someone was having a 'barn sale' of a lot of old items (they were tearing the barn down to put up a new one). 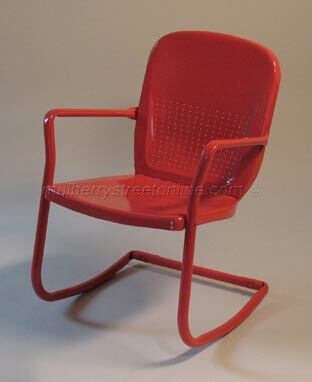 Of the items listed, my eyes latched onto the 'old time metal chairs'. I phoned them and told them there was no way I could make the drive (100+ miles) to get to their sale the next weekend, as I was just two days out of the hospital from major surgery, but was there some way I could get my hands on those old chairs, after we had decided they were exactly the kind I remembered (aka: motel chairs, bouncy chairs, etc.). 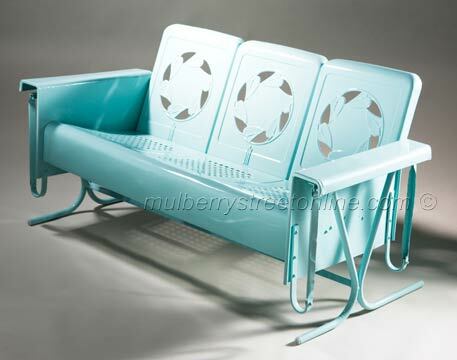 The vintage metal furniture was an ugly, over-painted many-times pastel blue, but for a summer, I left them like that. When my son and I moved to the old Folk Victorian (in a nearby small town), and the house went through a much-needed painting, I went to work on the chairs, scraping and sanding them lovingly by hand. This took me three weekends, and I was not so 'loving' about it towards the end: my hands were a mess. 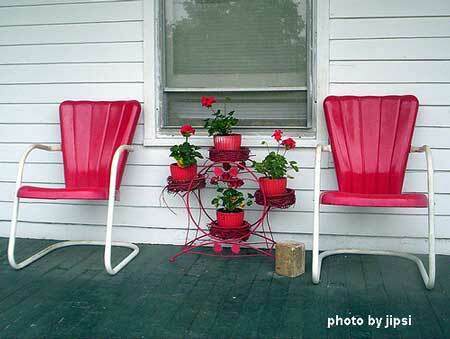 I was finally able to repaint both chairs the vivid 'cottage red', with white arms/tubing, to my liking. And I still think of that wonderful couple, and the barn sale I didn't get to go to (because they brought it to me, in a fashion). I wonder if they are as happy with their new barn as I am, with my 'old time metal lawn chairs' on my veranda, greeting all guests as they arrive. 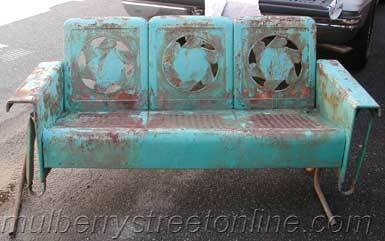 Our many thanks to Shea for sharing her photos and awesome story about vintage metal furniture with us.